Coming back to America, the country never quite ceases to feel like a Truman Show version of itself: a landscape dropped down from above with props and house facades and plenty of actors who do a tremendous job of pretending not to act at all. It feels familiar, but never quite natural. 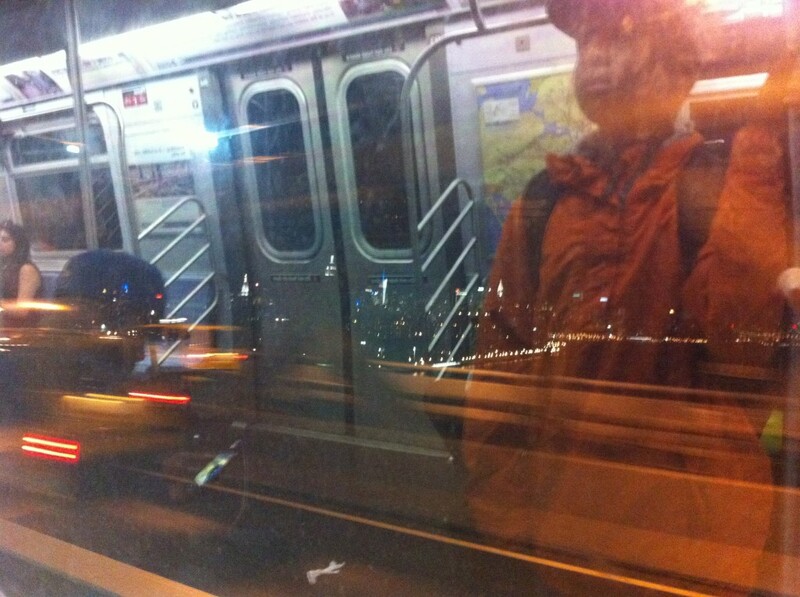 I’m riding the subway at night, long after the rush hour traffic has died down. “Dreams Become Realities”, proclaims the poster on the wall of the train car. It advertises the possibilities that will surely come with the certification as an office manager, or as a medical technician, or as a registered nurse. The faces on the poster smile innocently and earnestly, and one wonders whether that same smile would work for someone selling lottery tickets or magazine subscriptions. It probably would. Public transportation still stands as one of the great achievements of the city. It says: Regardless of where your dreams might become reality, this train will get you there. Pay the fare, find a seat, and enjoy the ride. On the subway, we are all equals. Yet one of the striking things about a large city’s subway is how greatly its persona varies, depending on the time of day and the route. It’s calm and tired in the early morning before the sun wrestles its way across the horizon, shuttling New York’s indispensable labor force from Rockaway and Bedford towards the big City along with a few early-morning arrivals from JFK airport. Busy and sweaty and hectic during the day and downtown, filled with big people typing furiously on little phones. Joyously ebullient as it rattles out to Coney Island on a Saturday morning, and drowsy from too much sugar and too many rollercoaster rides in mid-afternoon. Exhausted again at night, long after the rush hour traffic has died down. Exhausted from work, and exhausted from thoughts about the day ahead. I’m in two restaurants, around twenty hours and one mile apart. One has a frightening collection of silverware laid out on both sides of the plate and a little cooler that keeps the Pinot Grigio chilled. I’m meeting with a friend of a friend (both of whom shall remain anonymous here) who is earning their pay in the world of art collecting and art consulting (I’m assured that it’s a stressful business, but somehow the terms “labor” and “work” seem a bit inadequate – hence “earning their pay”). I learn how unfortunate it is that art prices have been climbing so quickly. Apparently, you used to be able to buy something decent for several hundred thousand dollars. Apparently, you can’t do that anymore if you’re concerned about collection quality. The restaurant where I learn this is billed as “the little neighborhood joint”, and, judging by the appearance of the place and its patrons, it’s a neighborhood that seems to know a thing or two about quality. The other restaurant has a wet floor and a sign that says, “Caution! Wet floor!” A commuter train from New Jersey has unloaded its bowels into the lower levels of Penn Station. I venture outside into the night. For anyone not from New York, or from a big city, early mornings and late nights hold a special kind of surprise: The constant humming of city life is muted and individual sounds and bangs and shrieks stand out more clearly. The curbs are wet from high-powered hoses, and the potholes and air vents are steaming. This is Gotham City, and somewhere in its deep valleys lies this restaurant. It is the kind of place where everything is mopped up in the wee hours of the morning: Bits of pizza crust, drops of spilled soda, and anyone who appears lifeless enough to warrant a custodial intervention. There’s no silverware here and too much neon light, but the basic parameters are the same: Tables to stuff yourself, and restrooms to relieve yourself. In biological matters, we are all equals. Here’s the thing: It matters that the subway doesn’t present us with a cross-section of New York’s commuter society, and that restaurants in adjacent parts of the city might as well be situated in two separate social universes. It matters precisely because the basic functions they serve – to move us and to feed us – are common needs and in that sense democratic: They are needs of the people. We don’t choose to travel or to eat, none of us does; because both are so deeply enmeshed with our existence that we would wither away without them, in social and physical ways, respectively. And because we don’t choose whether to move or eat, the question of how we choose, and what choices are available to us, takes on a societal and political significance. The differences in subway rides and restaurants don’t resemble different aspects of the same story and the same city so much as flashes of a severe case of dissociative identity disorder. DID, the medical dictionary informs us, “is a disorder characterized by identity fragmentation rather than a proliferation of separate personalities. […] It reflects a failure to integrate various aspects of identity, memory and consciousness in a single multidimensional self.” There you’ve got it, in plain scientific terms: It’s a process of fragmentation. A failure of integration. A refusal to internalize the inevitable fact that each lottery winner produces scores of less fortunate losers; that the pre-dawn rush hour greases the gears for the 9 a.m. crowds; that babies cry on the subway because a three-job routine does not leave much time for feeding; that we differ from each other not just in height and weight and interests but in the fundamental rhythm of our respective existences. In short: That the great democratizing force of public transportation and our fundamental sameness as eating and shitting members of the human race has not prevented us from living very separate lives. Lives without much interaction, and often without recognition. The laws of arithmetic aren’t the laws of society: The top plus the bottom doesn’t land you in the middle. It lands you in a mental ward. It’s especially evident in New York, a city so densely packed with people and languages. The beacon hand with world-wide welcome, the place where the DNA of America is laid bare. That’s how the story goes, at least. But it’s also a city of parallelism rather than pluralism, where separate people can live separate lives, and where the invisible hand is a force of demarcation as well as democratization. A city where the winners are sometimes those who lose more slowly. Maybe this is what makes America sometimes seem like the Truman Show: Each part appears perfectly normal and natural, even on close inspection. But gaze at it from a distance, through a wide-angled lens, and the American story seems oddly disjointed, like different plots within the same grand play. Plots that lack transitions and points of intersection. Plots that map out the Disjointed States of America. You don’t come to “America”: You arrive and live and breathe in one America or another. You arrive not in New York City, but in one city or another. Different countries and cities that happen to coexist in place and time, that overlap and intertwine and remain far apart nonetheless. It’s a nice song, and rather heartwarming. Because it’s by Bruce Springsteen, it inevitably measures out the gap between the American Dream and the American reality. A dream that has been hammered into our heads during months on the campaign trail: That America can be great if it buckles down, puts on its hard hat, and digs deep. Success will come with work, and prosperity with success. If not for you, then for your children, and your children’s children, and so forth. The American Dream is the great relay race of this and future generations, and America’s most beloved and most promising child is the middle class. We’re all in this together, it seems, because we’re all running the same race and striving for the same outcomes. Remember the line from 2008 about the Red States, the Blue States, and the United States of America? That dream hasn’t died. But I wonder: What does it mean to “take care of one’s own” in a country that seems so fragmented at times? And what is the obsession with America’s middle class if not a continued denial of the existence of all those who are too rich or too poor, too elevated or too downtrodden, too different to see and recognize each other even when their paths cross on subway cars, and whose lives are so radically different that they cannot and do not desire the same things? Who is partaking in the great democratizing process, and whom do we recognize as fellow members of a country and a culture? Whom are we taking care of? Indeed, the illusion of commonality cannot be sustained without a collective willingness to unsee the signs of fragmentation, and fragmentation cannot be stopped and stemmed without first recognizing its existence. So where, then, are the eyes with the will to see? Maybe that’s what makes America sometimes seem like the Truman Show, with props dropped down from above and plenty of actors who do a tremendous job of pretending not to act at all. It’s the gap between the words we hear and the world as it reveals itself. It’s the number of patches that are necessary to hide the symptoms of dissociative identities. It’s the assertion that the great forces of democratization and liberty and justice still work, not only for some of us, but for all.